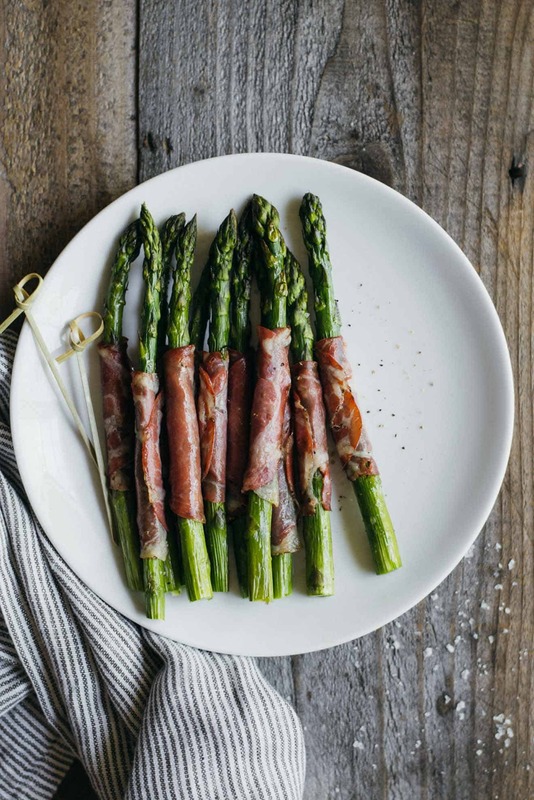 This dry coppa wrapped asparagus is one of my favorite appetizers to make. They’re flavorful, ready in 15 minutes, and can be made with 5 ingredients or less. 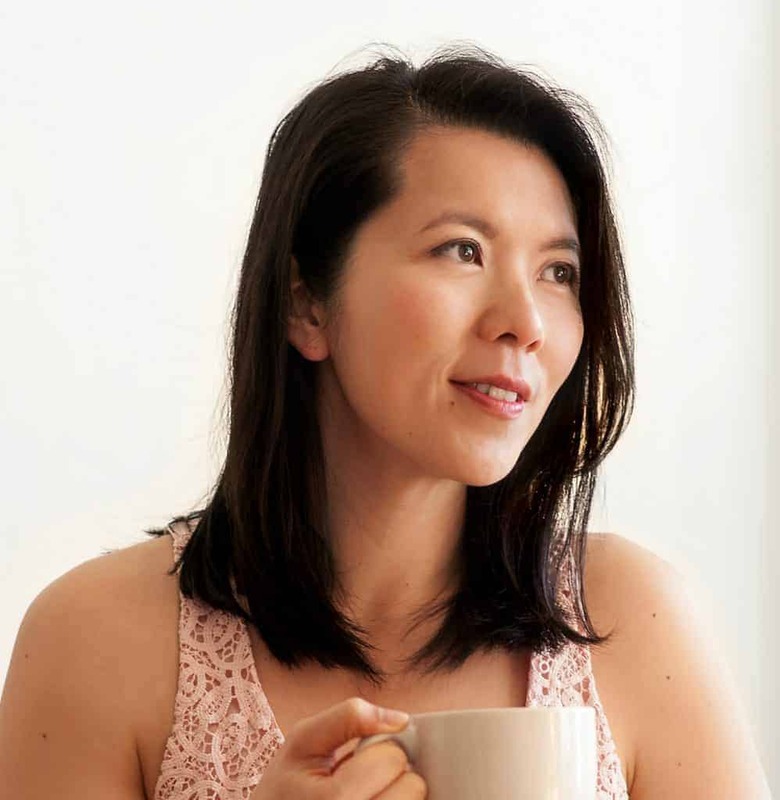 Thank you Columbus Foods for sponsoring this post! The thing that I find most charming about San Francisco is the uniqueness of each neighborhood. The Mission is aplenty with hipsters, tacos, bars, and coffee. In the Presidio, you’ll find endless stretches of natural green wonder with a nice dose of fog. Lots and lots of fog. Chinatown is where you’ll find people who appear to be arguing with each other but are actually carrying a perfectly normal conversation. All these pockets of the city add to its charm. During my middle school years (my tweens) North Beach was like a second home. This “Little Italy” is nestled right in between the calming waters of the bay and hustle and bustle of Chinatown. A walk along the often sunny Columbus Street, and you’ll be sure to find a bevy of Italian flags, cafes, restaurants, and gelato parlors that I became all too familiar with. That small sliver of San Francisco is a haven for any food enthusiast. I was so happy when Columbus Foods asked me to create a recipe with their craft meats. Not only have I been cooking with their meats for years, but I felt connected to the company because they were founded in North Beach! Nearly 100 years ago, the founders started air-drying salami in the neighborhood. The foggy climate of the city was just want they needed to make the perfect salami! 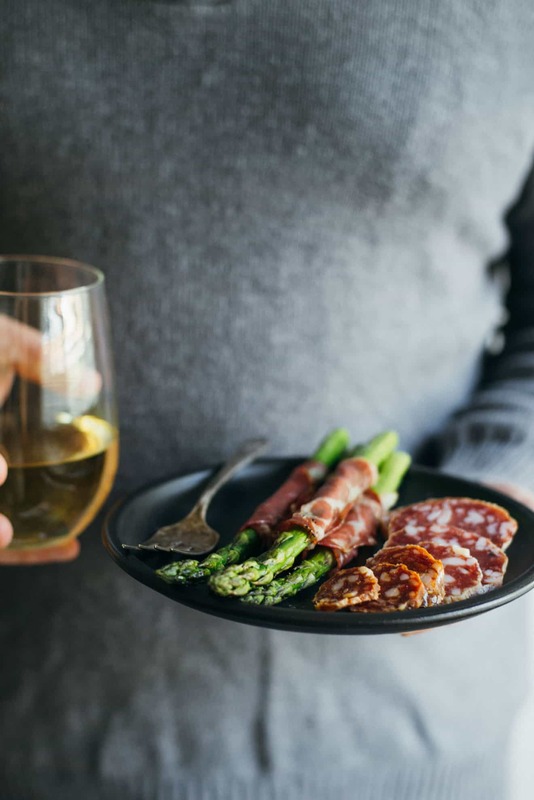 Many of us are having spring gatherings with friends and family, and with Memorial Day weekend just around the corner, I wanted to share a quick and easy appetizer recipe using Columbus’s dry coppa. The coppa is already thinly sliced when you buy it at the supermarket, which saves a lot of kitchen prep time. Plus, the asparagus cooks in just 8 to 9 minutes! 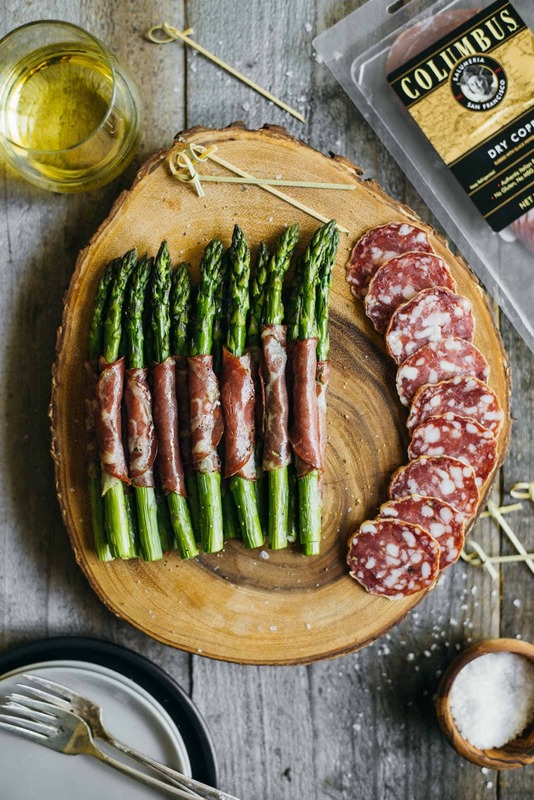 The roasted asparagus pairs so well with the savory and slightly peppery flavors of the coppa. Trust me, this will be a crowd pleaser! How to Prepare Asparagus: I usually give the asparagus a quick rinse to get rid of the soil that’s stuck on the stalks. Then, I pat them dry. I’ll snap off the ends of the asparagus. I learned this tip from Ted Allen when he was on Queer Eye—the asparagus will naturally snap at the point between the part is good to eat and the part that’s too woody. For the purposes of these photos, I snapped and then trimmed the bottoms so that they looked neater. 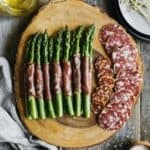 Alternatives: Don’t have any asparagus at home? Try wrapping the dry coppa around sliced bell peppers. They taste great! P.S. While you’re at it, try some of Columbus’s Felino and Hot Sopressata salami. It’s so delish. If you make this recipe, let me know! Take a photo of your creation and tag me on Instagram so that I can give you a fist bump! 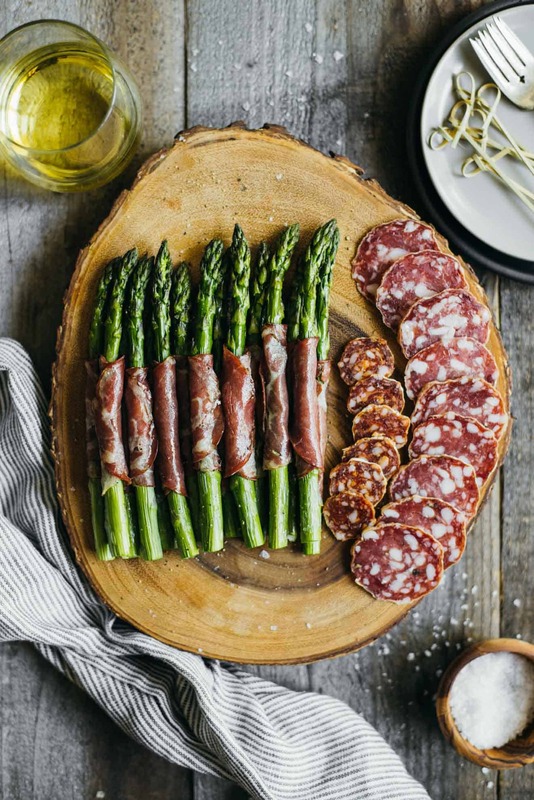 This dry coppa wrapped asparagus is one of my favorite appetizers to make. They’re ready in 15 minutes and can be made with 5 ingredients or less. Preheat oven to 425 degrees F (220 degrees C). Line 2 baking sheets with foil. Spray foil with oil spray and set baking sheets aside. Take the coppa out of the packaging and separate the slices. Trim the bottoms of the asparagus stalks. 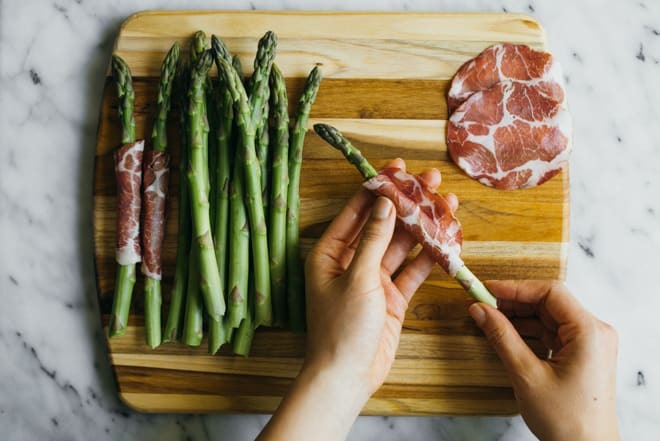 Wrap each stalk with a slice of coppa and set on top of prepared baking sheets. Spray asparagus with more oil spray, and sprinkle with a pinch of salt. Bake for 8 to 9 minutes. Remove from oven and season with freshly ground pepper. Serve immediately. If you don’t have any asparagus around, try using sliced bell peppers! The cooking time is the same, and they taste great, too! This looks like the perfect way to jazz up asparagus, aaaand now I want to go back to San Francisco. I’ve only been one time, and I feel like I only saw a tiny part of the city. You definitely need to visit again! It’s changed sooo much in the last 5-6 years, I don’t even recognize parts of it anymore! I am always amazed at the different ways to make asparagus. This looks great! These look like little bites of salty, meaty goodness. I love coppa wrapped in peaches too. But since peaches aren’t here yet, I think I’m going to do make these asparagus for Memorial Day weekend! And I totally miss all the cool neighborhoods in San Fran (and Seattle, too)! These are little bites of heaven. 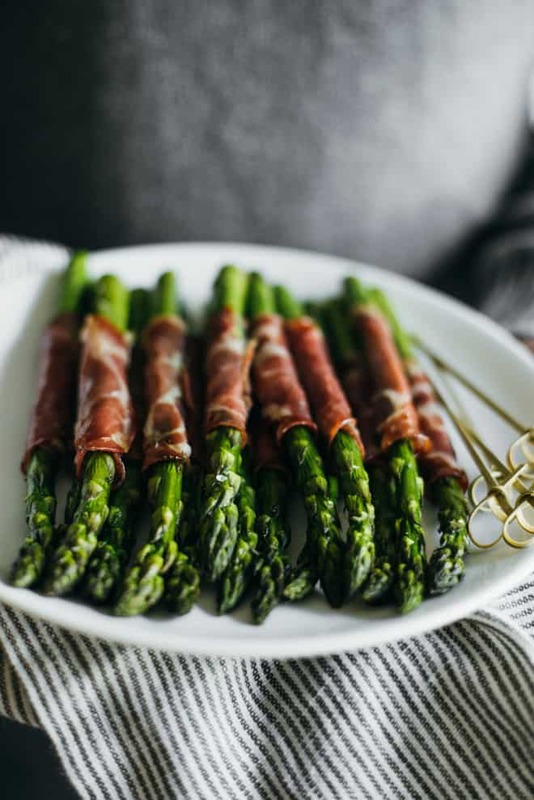 We always wrap breadsticks and prosciutto together in my family for holiday appetizer spreads, this is a great veggie twist to that. Love me some coppa! Thanks, Gina!! Oooh, I love that prosciutto-wrapped breadsticks idea! 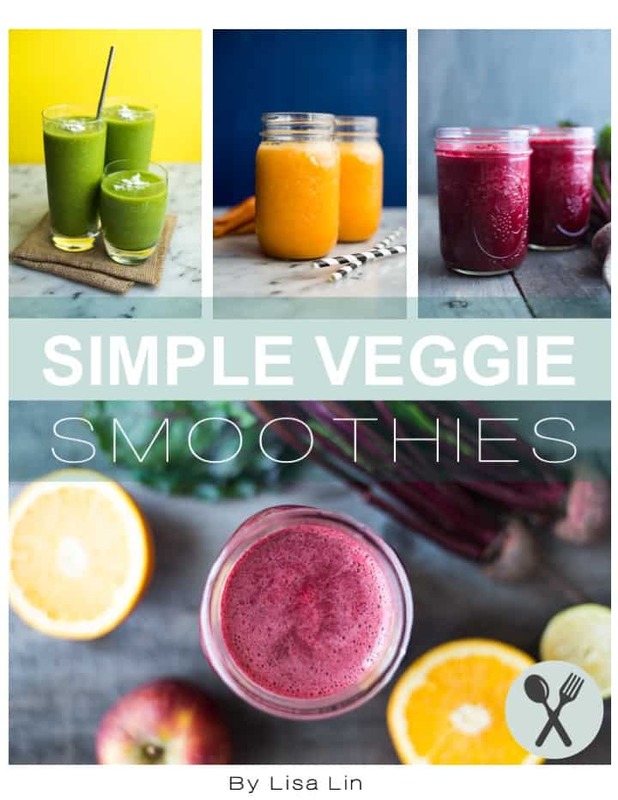 I’m gonna head to buy all of the ingredient to this right now – and bell peppers too! Great substitute idea, but I want it all!